After dropping the initial set, it became fairly clear that if the Burroughs High girls’ volleyball team was to advance past the CIF Southern Section Division III quarterfinals, Marin Grote would need a Herculean effort. The 6-foot-5 inch junior outside hitter delivered one, but it still wasn’t good enough to push the Indians past visiting Foothill on Saturday as the Knights prevailed, 25-18, 21-25, 25-22, 25-16. Grote finished with a career-best 29 kills after a 27-kill effort against Los Osos in a second-round match. The next best was nine kills from senior middle blocker Caleigh Paster, who played well throughout the season and this playoff run. The swing set was the third and it was a heart-breaker for those following the Indians (22-10). Foothill raced to a 4-1 lead in the third game with a kill from senior outside hitter Natalie Gray. The Indians roared back, tying it at 7-7 on Grote’s dagger. But the Knights eased ahead 13-10 on a winner from sophomore outside hitter Marissa Mazurie. 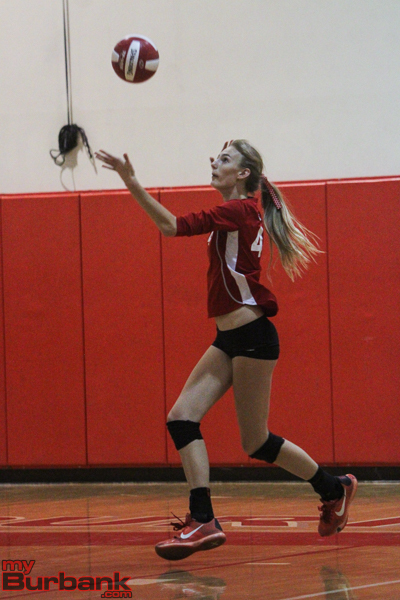 Burroughs came within 17-15 on Grote’s winner, however, the Knights bolted ahead 20-18 on a kill from sophomore middle hitter Grace Cannon. 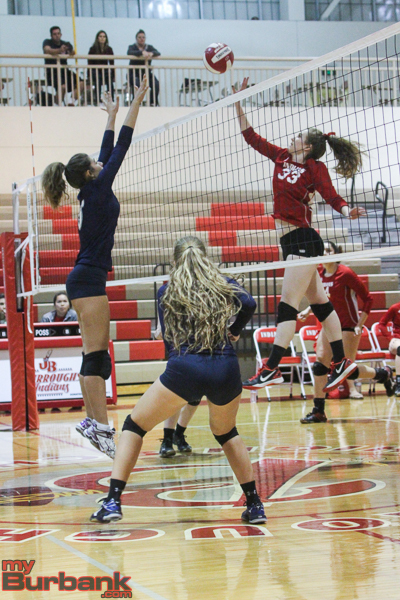 The Indians zoomed in front 22-21 on a duo block from Grote and sophomore middle blocker Juliana Van Loo. The Knights would grab the next three points for the set including a stuff from sophomore setter Eliza Cannon that made it 24-22, and the clincher from senior middle hitter Imani Moreen. Burroughs took the second game and pulled in front 4-1 on an ace from Paster. It was level at 7-7 on a winner from junior opposite hitter Emily Botzbach and 9-9 on a combined stuff from senior opposite hitter Sophia Rizzotti and Paster. The Indians would forge a 17-12 advantage on Van Loo’s winner, and would pull ahead 19-14 on Grote’s spike. Burroughs took command 22-18 on another Grote smash and Grote would end the set and tie the match with a kill. The opening set was close in the early stages, tied at 3-3 on a winner from Eliza Cannon before Foothill went on an 9-4 spurt that made it 12-7 on Grace Cannon’s kill. With Gray’s winner, the Knights led 14-8 as Real called time out. But Foothill went on a 4-2 spurt and moved ahead 18-10 on Moreen’s winner. The Knights took a 21-13 lead on a stuff from Grace Cannon. The lead swelled to 23-15 on an ace from senior outside hitter Remi Lehnertz, before Gray’s bomb gave the visitors the set. Foothill came out in the fourth game and led 3-1 on Eliza Cannon’s kill and 10-3 on a stuff from Garce Cannon and Mazurie. The Knights seized control 16-8 on a winner from Mazurie and 20-10 on Moreen’s spike. Mazurie’s kill made it 24-14 and when Grote’s swing sailed into the net, the Knights took the set and match. This entry was posted in Girls Volleyball, Sports and tagged Burroughs High, CIF quarterfinals, Girls Volleyball on November 6, 2016 by Rick Assad.